Ear Piercing for Migraines - My Shocking Results after One Month! After trying this ear piercing for migraines and announcing it here, I was shocked to hear from so many of you that you also suffer from horrendous migraine symptoms. As promised, I kept a daily journal of my experience after getting my daith piercing. Below you will find my unedited journal. You can read more about my specific migraine symptoms in detail here, but it is extremely important to note that migraines are NOT headaches. The headache is just one symptom of a migraine. After over 20 years suffering from severe migraine symptoms–of which the headache is by far the worst for me–I decided to try this ear piercing for migraines. There have been no clinical studies that I’m aware of to support this as a method for treating migraine symptoms, but I deemed it worth the risks. I have heard that about half of the migraine sufferers that have tried it reported some sort of relief. So, I kept a detailed journal of my experience to collect my own data to share. I am not recommending this for anyone, I am simply sharing my experience. You can make your own decision on what is best for you and definitely speak with your doctor. Day 1, Feb. 18, 2016 – Migraine. Got daith pierced. Instant partial relief that lasted the rest of the night. Day 2 – 2/19 Very light sensitive, ended up taking 400mg of IB Profen because piercing area was sore. But that wasn’t enough IB Profen to even touch a true migraine if it were going to come back… I kind of felt like I was going to get one, but it never came. Day 3 – 2/20 Felt fine. Piercing still sore. But took no meds. Day 4 – 2/21 All good. Day 5 – 2/22 Terribly light sensitive. Thought for sure an aura was going to follow. Had some nasty tension in my shoulder so Evan gave me a 5 minute massage. No migraine and no meds taken. Day 7 – 2/24 Taking a ridiculous amount of naproxen sodium (Aleve) for cramps. 🙁 Not a fair test today. Stupid periods. Day 8 – 2/25 Still light sensitive but no headache or aura. Took one naproxen sodium for cramping. Day 9 – 2/26 Thought for sure a full blown aura was about to hit–super light sensitive and just ‘off’ but it never did. No meds taken. Day 10 – 2/27 Pretty good day but lost bottom bead to earring in the evening. Slept sort of nervous because it felt like I was going to lose the bar. Day 12 – 2/29 LEAP DAY! Feeling fantastic. Not even light sensitive. Day 13 – 3/1 Felt great all day. Day 14 – 3/2 Awesome. Even forgot my sunglasses and didn’t mind. Day 15 – 3/3 Had an issue with low blood sugar. I got busy and forgot to eat lunch, then hopped on the treadmill (duh, so dumb) and ended up a shaky mess with my blood sugar at 46. I thought I was getting a full blown aura but it turned out it was just my blood sugar. I ate a few sweets and recovered for the most part but still felt pretty lousy. No meds taken. Day 16 – 3/4 Feeling very fragile today. Very much like I’m on the verge of a full blown migraine attack. Light sensitive, sound sensitive, sore neck muscles… but still no headache. Day 17 – 3/5 All good. No symptoms at all. Day 18 – 3/6 All good. Day 19 – 3/7 Smidgen of light sensitivity, otherwise nothing else. Day 20 – 3/8 All good. Day 21 – 3/9 Definitely ovulating and still all good. (Sharp pain on right side of lower abdomen–typical for this time of month.) No meds taken. Day 22 – 3/10 Moderate pain due to ovulation and slight visual aura. No meds taken. Day 23 – 3/11 All good. No meds. Day 24- 3/12 All good. No meds. Day 25 – 3/13 All good. No meds. Day 26 – 3/14 All good. No meds. Day 27 – 3/15 Super strong visual aura. No meds taken. No headache. Day 28 – 3/16 All good. No meds. Day 29 – 3/17 Light sensitive. No meds. No headache. Day 30 – 3/18 Light sensitive. No meds. No headache. Day 31 – 3/19 Light sensitive. No meds. No headache. OMG! I cannot believe I have gone 31 days headache free! I’ve definitely had other migraine symptoms but the headaches are by far the worst and most debilitating. I can totally function with all the other stuff. So far, if this is at all due to this ear piercing for migraines, I’d say it’s been absolutely worth it. Honestly, even if it is some strange placebo effect, I’ll take it! It’s only been 31 days, but I went from 4+ migraine headaches a month, to zero. 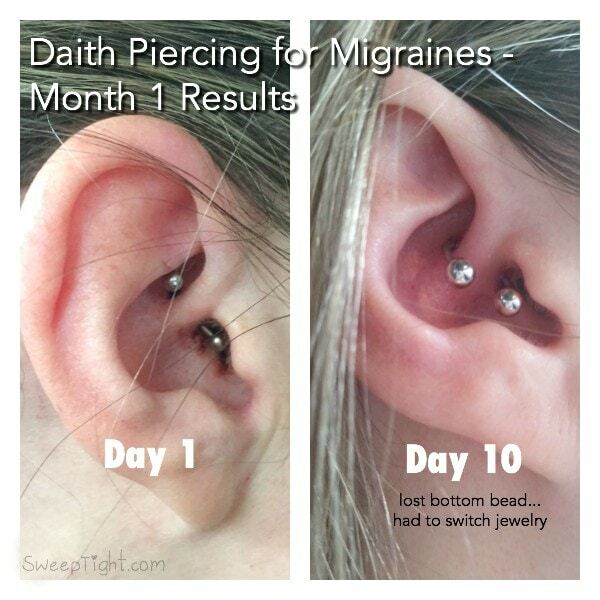 One of my blogger buddies/fellow migraine sufferer decided to try the daith piercing for migraines too! You can see her results here. CHECK OUT MY DAITH PIERCING RESULTS AFTER 6 MONTHS! ONE YEAR UPDATE ON THE MIGRAINE PIERCING! Does it hurt to get the daith piercing? The piercing itself doesn’t “hurt” that bad. It’s a lot of pressure and then tender when the jewelry is put in. I did have a good bit of soreness in the 3-4 days immediately following but a couple IB Profen worked wonders. How do you clean the daith piercing? In the first week to two weeks, I was instructed by my piercer, Hershey, to make a salt water solution (1 tsp sea salt *not iodized* + 8 oz distilled water) and clean the area 2-3 times a day. I would pour about 2 tablespoons of the solution into a microwavable cup and heat for 9 seconds. It gets super hot, super fast! I would then soak a cotton ball with the hot salt water and put it on the piercing. It feels AMAZING. If any little crusties (sorry, I know that’s gross) were present, I’d use a sterile Q-Tip to wipe them away. Moving the jewelry is not necessary for cleaning. While in the shower, I just let the water run over and into my ear like it normally would. I can’t have visible piercings at work, but want to try this for my migraine symptoms. How easy is it to hide? With the initial barbell I had, no one could see it when looking at me head-on. It’s only visible from the side if you’re looking into my ear. You’d have to talk to your piercer, but you may be able to use a clear or flesh-tone piece of jewelry. You can definitely switch to something like this after the initial healing process but I think you may need to have surgical steel daith earrings in the beginning. 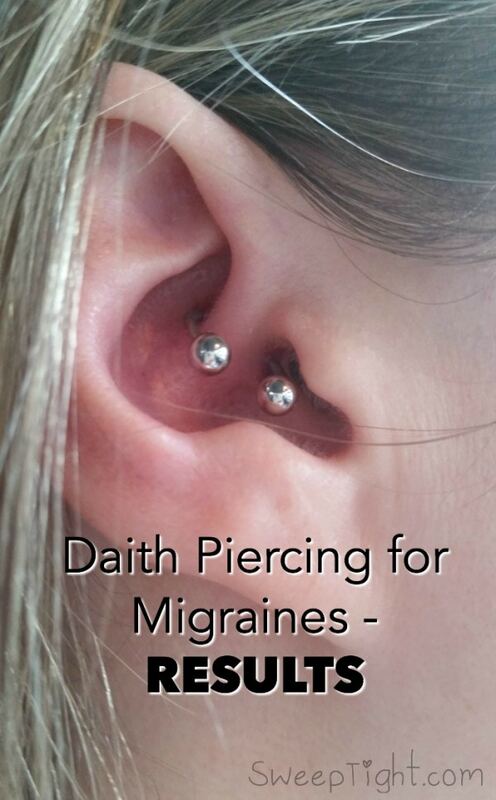 There’s a full daith piercing for migraines FAQ post to read, too. Would you consider this ear piercing for migraines? Did you have to go to a doctor or specialist? Can any piercing shop do this?? Is it just the general area that counts? I’m so excited about this!! I went to my local piercer. As far as I know, any piercer should be able to do this. As long as you specify that you want the daith pierced. Again, since there are really no ‘official’ studies, I’m not sure if it’s a super specific spot… the daith isn’t that big after all, so chances are it will be okay if it’s going to work at all for you. Good luck and please share your experience with us if you decide to do it! This helps a lot! Thank you!! I was scared to. 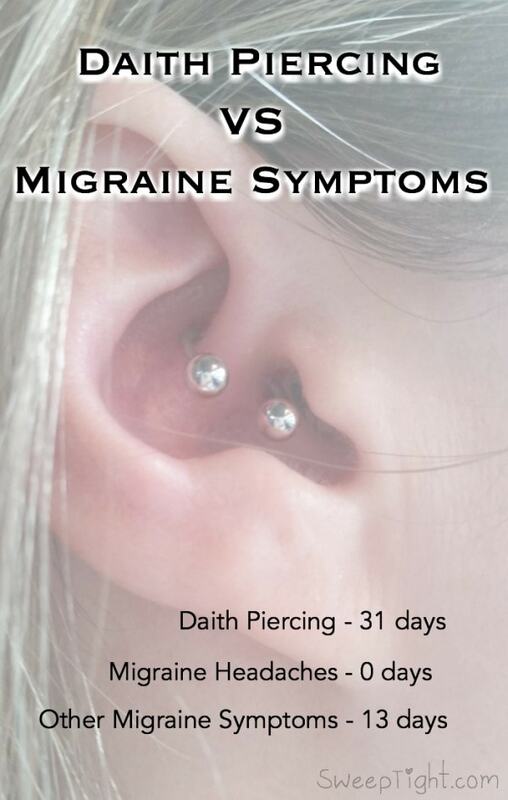 Honestly, if you suffer from migraines then peircing the daith will be a piece of cake. I have a Darth piercing for migraine. I can’t tell you anything for sure, but my auras and visual symptoms did go away (almost completely) after a few months. I hope you continue to have relief! Hi Joyce, I am going to get mine pierced on Saturday. I am suffering with Aura migraines and I am on a strict diet from my neurologist and I’m still having some migraines and I am prepared to try most things, they last 4 to 5 days so I hope it will help. Saturday, bring it on !! 31 days without a migraine is wonderful for you. Luckily I don’t get them. I got mine done on 1/4 for my birthday and I have maybe 2 migraines since that time. I used to have 3-4 serious migraines a week. It is really a miracle. Wow Dena! That’s fantastic! Thank you for sharing!!! I used to get migraines more when I was a teen and in my early 20s. It does happen once a month or so, but I still get auras and sensitivity fairly frequently and always have to make sure I don’t skip a meal at all. I do have a question. Do you do it on a particular ear? Right or left, or both? I spoke with a friend of mine that studied acupuncture in China and she recommended getting the piercing on the same side you experience the pain. So I got mine on the right since that’s always where the migraine headache pain is. While I don’t have true migraines often, I do get some pretty nasty headaches with migraine symptoms. Maybe they are migraines and I just am not aware or maybe just really bad headaches but either way I want to get this done for myself soon! I’ve also heard this is a particular pressure point to help with chronic pain as well so I definitely want to give it a try. This is absolutely fantastic; I love the way you recorded everything for a month and wrote down your experiences 🙂 Now I know what to do when I get mine done! I really hope this provides some sort of relief for you! I can’t wait to hear about your experience! Shelley! I had no idea that you suffered with migraines too. I have for about 15 years and they’re no fun. The doctors just have me on a triptan and I’ve tried everything (well kind of) medicine wise. They cannot find a cause for them. Someone told me about this piercing and I was a little leary of it. However, I am going to look into it more!! Thanks for sharing. This is the first I’ve heard of this. I used to get horrible migraines, but not much anymore. I would definitely consider this if they ever come back. Did you get one or both done? If one side, which one and why? I just got the right side done. You can see the whole story behind that in another one of the daith piercing posts. I loved reading this. I got my daith pierced and I’ve gotten nothing but hate about it saying that it’s all in my head and multiple rude comments. Headaches have decreased by a lot! Better than having migraines 24/7. I’d love to hear how you’re still doing! I used to have about 16 migraines a month and through some medication changes, I am down to about 10 per month. I have tried botox, Dysport, and many different daily meds to prevent them, with no luck. I just read this post yesterday, and I had an appointment at my headache clinic today so I brought it up! My doctor said that although it isn’t FDA approved and she can’t recommend it to me, she has had about 6 patients have it done. 3 of them don’t have migraines anymore. 2 have them less frequently, and 1 had no change. Needless to say, I am looking for a place to get it done now! I’m so glad you wrote this. I’ll let you know once I’ve gotten it done and how it works for me! WOW thank you for sharing that info! That’s so excited to hear that you’ve also been told similar info to what I was told. I can’t wait to hear about your results! I get migraines alot and it’s to the point where it will make me very sick to my stomach. I have had a friend and one of my sisters tell me about this piercing. I wanna try it but not sure how much it will cost to get it done. Sometimes I wonder if I’m even going to get rid of it. Oh Dede, I feel your pain. Thank you for sharing your story. I hope this works for you as it has for me! Please let me know how it goes! I am a fellow suffer of chronic migraines due to a tumor attached to my pituitary gland. (Its located directly between my eyes and reaches as far as the middle of my forehead. I see a specialist at the moment and I am not a candate for the Botox injections they have recently been promoting for chronic pain and migraine symptoms. Sorry for so much back details but i was very curious and kind of excited in a way to see such positive results from something so simple. It seems like the one time amount of pain is nothing from the daily pain many of us suffer from due to these extreme headaches. Is this a piercing you had done in one ear or both ears? And did your doctor have any feedback negative or positive about it? At this point I am desperate for any sort of relief and eager to live a normal life as most people do and not constantly have to take medication for something that you seem to have such positive and effective results with from such a simple concept! Would love to hear your thoughts, details. Thank you! Should this be done on both ears for effectiveness? My goodness, I am so sorry you suffered for so many years. I’m so thrilled the daith piercing worked for you! You deserve all the pain free years to come! So I used to have migraines when. I. Was younger, but they came back after having my daughter. The headache and nausea are the worst symptoms for me by far. I can’t believe I’ve never heard of this treatment before! I’m off to read the rest of your posts and feeling very hopeful! If you get migraines only on the left side..do you pierce the left ear or the right ear? Where do most of your migraines happen? Is it the same side that you got there piercing or the opposite? I have had terrible migraines since 6th grade and am now 25. I have gone to way too many drs at this point and its either i try alternative solutions or i stay on permeant control medicines for the rest of my life. Most of my migraines happen on the right side sometimes on the left but its very rare. I talked to a body piercer that is near by and knows and has done faith piercings before but not for migraines, so don’t know which side i should get it on. Any suggestions on which side or just do both sides? Very interesting, I never heard of this before. I take topamax daily to try and prevent my migraines from occurring as well as get Botox injections every 3. months. One of my migraine triggers is berametric changes in the weather. Do you know if daith piercings would still help? I’ve had migraines for 38 years. Many years before the “proper” medication even hit the market. I had an average of 3 a week, sometimes more. Although finally controlled very well with 100mg of imatrex, I was so over it all. After some research I took a leap. I did both sides, because as I stated, I was over it all & wanted it to work so badly. The piercer that I went to also advise both sides, stating that most people come back anyway. Greatful to state, after 6 months, migraines are EASILY down to 4 a month & 50mg of imatrex. Not as successful as others but I’ll take it any day. You do have to stay on top of the cleaning but again I’ll take a little salt water over chemicals in my body any day. Just thought I’d share my story. I’d recommend daith piercing to anyone with migraines, plus piercing is super cute. Thank you for sharing! So happy to hear you’ve had some relief! Thank you for sharing. Please come back and let us know how you're doing!